A portrait of President George W. Bush using monkeys to form his image that was banished from a New York art show last week amid charges of censorship was projected on a giant billboard in Manhattan on Tuesday. Bush Monkeys, a small acrylic on canvas by Chris Savido, created the stir last week at the Chelsea Market public space, leading the market's managers to close down the 60-piece show. Animal Magazine, a quarterly arts publication that had organised the month-long show, said anonymous donors had paid for the picture to be posted on a giant digital billboard over the entrance to the Holland Tunnel, used by thousands of commuters travelling between Manhattan and New Jersey. The original picture will be auctioned on eBay, with part of the proceeds donated to parents of US soldiers wishing to supply their sons and daughters with body armor in Iraq. US Secretary of Defence Donald Rumsfeld came under fire from soldiers in Kuwait earlier this month who complained that they had to use scrap metal to armor their vehicles. "Many of my friends are over in Iraq," Mr Savido said in a statement. 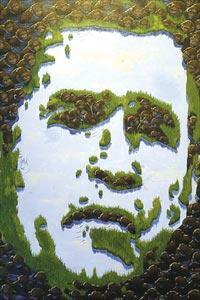 The painting offers a likeness of Mr Bush but the image is made up of monkeys swimming in a marsh. It was originally priced at $3,500 in the show's catalogue. Organisers expect more than 400,000 drivers to see the billboard each day for the next month.